Heat oil, fry 100g of ladies finger and keep aside. Take 600g curd and add 300ml of water and blend well. Add 50g of Aachi Butter Milk Kulambu Masala. Heat 25g of edible oil to fry mustard seeds, curry leaves, dried red chillies and add it to the curd mixture. Keep the seasoned curd mixture in low flame and add the fried ladies finger to it and boil. Add curry leaves, desired quantity of salt to taste. 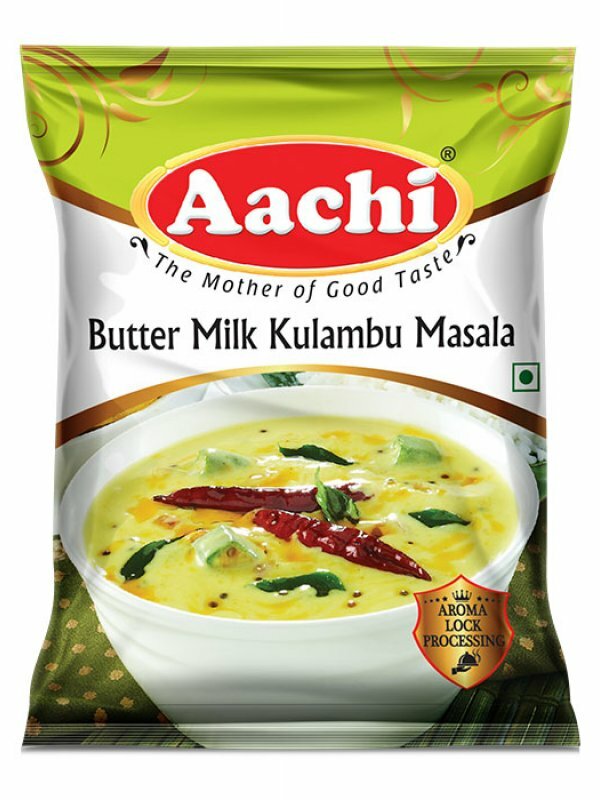 Now tasty Aachi Butter Milk Kulambu is ready- to- serve. Cumin, Rice, Chilli, Dry ginger, Asafoetida, Turmeric, Salt, Gram dhal.